I love pizza, it’s such comfort food and incredibly versatile. 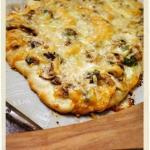 This dough works perfectly each time, has great texture and isn’t remotely fussy. I love to add a bit of petit épeautre (Einkorn wheat) flour when I have it for a bit of nuttiness in the flavour. For toppings, you can do anything you like. My two favourites are mushroom with asiago and “tartiflette” with crème fraîche, caramelized onions, potatoes and lardons. When I go to Pizza Phil’s in Bédoin, this is what I order. However, when I can’t get it, I make it myself. 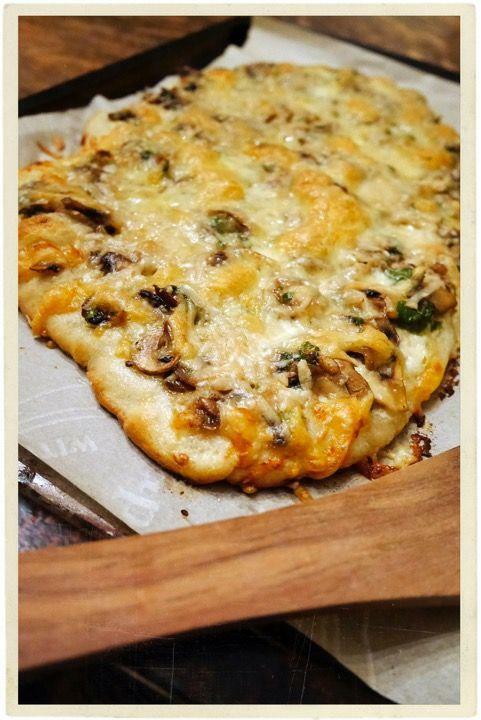 Perfect Pizza dough recipe (PDF) or print the version below. Sure you can order pizza, but it is way more fun to make your own. 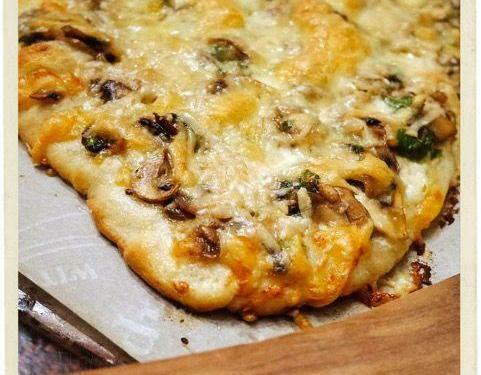 This dough recipe never fails to make perfect pizza. In a small bowl, dissolve honey in 1/4 cup warm water then sprinkle on yeast. In the bowl of an electric mixer fitted with a dough hook combine flour and salt. Add oil, proofed yeast mixture and remaining water. Mix on low speed until combined. Dough should form a cluster around the hook. If too runny or too stiff, add flour and/or water until you get the right consistency. Turn up speed and knead the dough for 5 minutes until dough is smooth. Turn out dough and knead by hand for a few minutes. Place in a clean bowl in a warm spot and cover with a damp towel. Let rise to until double in size, 1 to 2 hours. At this point, you can put dough in a sealed plastic bag in the fridge until ready to use (up to 2 days). I usually make two pizzas with this amount of dough. Divide into two, and knead for a few minutes. Place the dough on a parchment or cornmeal lined baking tray. Stretch out dough to desired thinness using your hands (much easier than a rolling pin). Repeat with the second half of dough or save for another day. Prepare and arrange toppings as desired. Bake for 7-12 minutes until bubbly and golden. When stretching the dough, if it keeps bouncing back, place a towel on top of the dough and let it rest for 10-15 minutes to let the gluten relax.